Although none of the following CDs were listed in my "official" Top 10, any one of them could have made. You may notice the preponderance of recordings with Matthew Shipp and why not? He's one of the more original musicians on the scene, never worrying about "the fashion of the day." Mr. Shipp goes in a number of fascinating directions on "I've Been To Many Places" (Thirsty Ear), from Gershwin to Coltrane and through his own fertile mind. This solo recording stands out in an impressive discography as does his latest Trio CD, "Root of Things" (Relative Pitch) - the work of drummer Whit Dickey and bassist Michael Bisio is so wild and free yet always interacting with the pianist. Perhaps my favorite release with Mr. Shipp is "Alternating Currents" where he is a part of a cooperative Trio recorded by and released by drummer Jeff Cosgrove, an ensemble that also features bassist William Parker. All good music and well worth checking out. Pianist Manuel Valera, who is usually seen in the company of his New Cuban Express or Trio, self-released "Self Portrait" this year - listen to this all the way through and you hear a musician reaching for the stars. Producer Todd Barkan continues to reach back to his days at San Fransisco's Keystone Corner to surprise fans of Jaki Byard with more solo piano music from his concerts in the Bay Area venue. "The Late Show: An Evening with Jaki Byard (HighNote Records) - one can hear just how much the great man influenced pianists who are active today. The duo of Steve Wilson (reeds) and Louis Nash (drums and more drums) has worked together over a decade but released its first CD, "Duologue" (Manchester Craftsmen's Guild) and what a delight it is. True masters at work! Avishai Cohen (trumpet), Omer Avital (bass) and Nasheet Waits (drums) make up the trio Triveni and create such delightful sounds together. "Dark Nights" (Anzic Records) is their 3rd collaboration and continues their streak of excellent sessions. In a year where so many piano trio CDs were released (why should this year be different from others? ), "Affirmation", the 2nd CD from the Jason Yeager Trio (Inner Circle Music), was certainly a real treat. His teacher, Fred Hersch, had yet another as performer and producer. Palmetto Records not only released the stunning DVD of "My Coma Dreams" but also his splendid new Trio disc, "Floating" featuring bassist John Hebert and drummer Eric McPherson. Talk about "super groups" - drummer/composer Jeff Ballard released his debut as a leader, "Time's Tales" (OKEH Records), with his good friends Lionel Loueke (guitar) and Miguel Zenon (alto saxophone). This is "dance music" for the heart, mind and soul! Alto saxophonist Alex LoRe released his debut Cd as well - "Dream House" (Inner Circle Music) has a "dream team" of a rhythm section in bassist Desmond White and drummer Colin Stranahan. Such fun music! As the year moved and I returned to CDs reviewed previously, "Inward Looking Outward" (RopeaDope), the debut of pianist J J Wright kept jumping to the top of the pile. With drummer Nate Wood and bassist Ike Sturm, Wright created a program of originals and "pop" covers that tickles the ears while making one think - that's a talent. Tyshawn Sorey continues to go in his own mind-stretching direction. His CD "Alloy" (Pi Recordings) features bassist Chris Tordini and pianist Cory Smythe playing 4 pieces driven more by melodic fragments and textures than formidable beats. Music one can truly get lost in and be happy for the experience. Here's the initial entry for the 2015 list - Sam Newsome's brilliant solo (with multiple overdubs) CD "The Straight Horn of Africa" (self-released) is an utter joy and a true work of art. The final entry will feature groups sized 4-7 and probably won't be posted until next week - family is on the way. Another fine year for vocal recordings, especially from the distaff side. My "official" Top 10 listed only Kavita Shah's "Visions" (certainly worthy) but here's a list of the others I enjoy and deserve to be considered "Best Of.." as well! At the risk of repeating myself from the 10,000th time, what a great year for creative music, Black American Music and contemporary classical music. I have voted in several polls including the NPR Music Jazz Critics Poll, in which the writers are limited to 10 new releases and 3 Re-issues or Historical releases. If you followed this blog as well as the column/blog published by the Hartford Courant from from 1997-2009, being confined to 13 is not easy for me. For this post, I'll start with the list for the NPR poll. Next week, I'll get to the ones that just missed making that list but deserve recognition. Click on the labels to go to pages that tell you more about the albums and more. 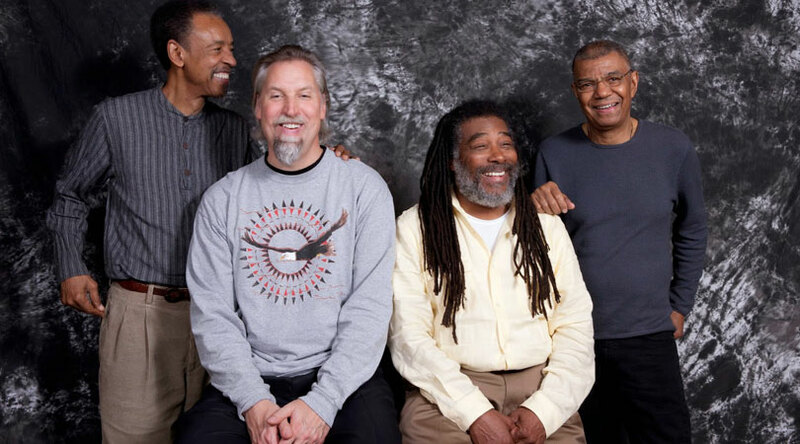 Wadada Leo Smith - The Great Lakes Suite - TUM Records - features Henry Threadgill, John Lindberg and Jack DeJohnette (above left). Darryl Harper - The Need's Got To Be So Deep - HiPNOTIC Records - This could easily have been at the top - the music and the concept are so fresh. Kavita Shah - Visions - Inner Circle Records - Co-produced by Lionel Loueke, also chosen as my best vocal album of the year. Her show at The Side Door Jazz Club earlier this year was a knock-out. Hafez Modirzadeh - In Convergence Liberation - Pi Recordings - stunning music from an ensemble that includes ETHEL, trumpeter Amir ElSaffir and the great vocal work of Mili Bermejo. Arturo O'Farrill & The Afro Latin Jazz Orchestra - The Offense of the Drum - Motema Music - Also my choice for Latin Jazz album of 2014. Orrin Evans & The Captain Black Band - Mother's Touch - Posi-Tone Records - Soulful, bluesy, creative and exciting, Mr. Evans struck it rich this year with this ensemble plus his work with Tarbaby. The David Ullmann 8 - Corduroy - Little Sky Records - Going back to this CD, I realize just his fresh this guitarist's music is - could easily be higher in the list. 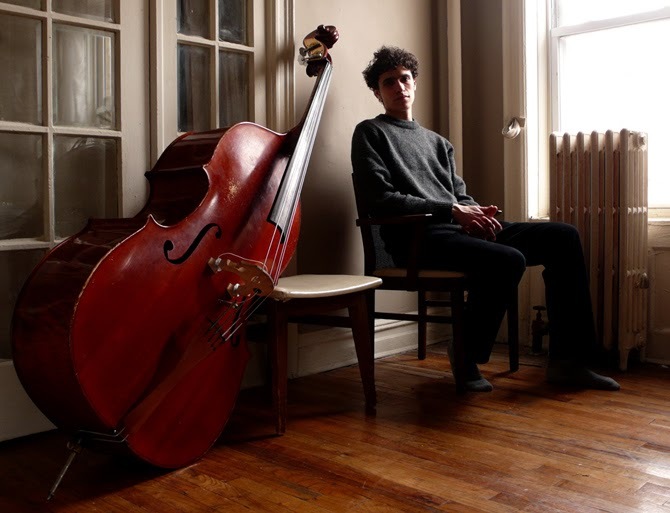 Noah Garabedian – Big Butter and The Eggmen - BJU Records - The music created by this bassist for his debut (!) is quite mature and great fun. My picks for Historical Albums and/or Reissues include Charles Lloyd – Manhattan Stories (Resonance Records), Jimmy Guiffre 3 & 4 – New York Concerts (Elemental Music) and Charlie Haden/Jim Hall – Live 1990 (Impulse Records). 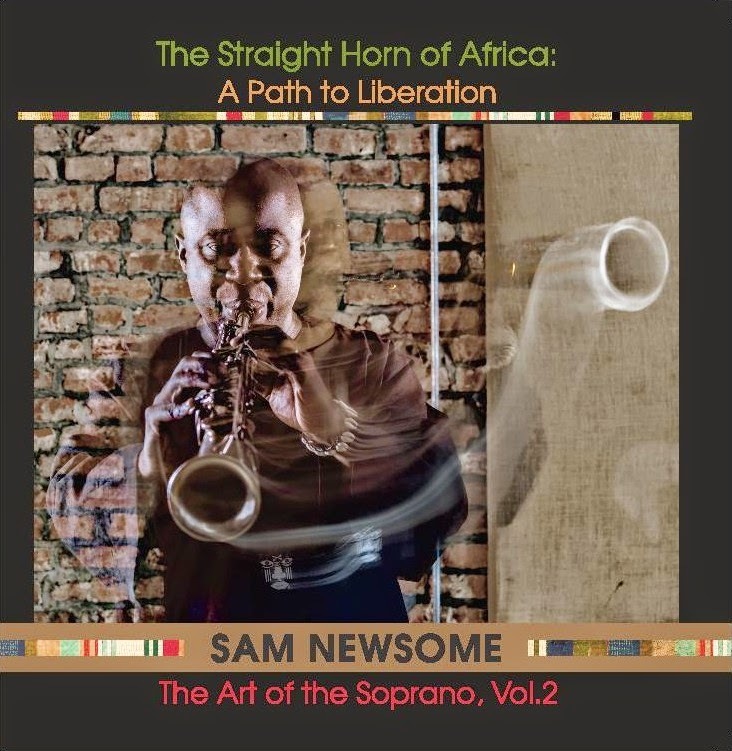 With the release of "The Straight Horn of Africa: The Path to Liberation" (Some New Music), the adventurous soprano saxophonist Sam Newsome continues his exploration of solo performances. This new recording, subtitled "The Art of the Soprano, Vol. 2", uses African percussion (courtesy of "slap tonguing and multiple overdubs), harmonics, circular breathing and sinuous melodies to tell a 21-song program and to seduce the listener. Over the course of (now) 4 "solo" CDs, Mr. Newsome has explored the music of Thelonious Monk, John Coltrane, Duke Ellington, the Blues and its African roots. "The Path to Liberation" features lovely melodies, soprano saxophone choruses, abstract sounds, microtonal experiments, dazzling dances, most if not all inspired by the myriad voices of the African continent. The use of overdubs brought to mind the "solo" work of Julius Hemphill, in particular his self-released 1977 masterpiece, "Blue Boye", reissued on CD in 1999 on Tim Berne's Screwgun label. The music is totally different - for one, the earlier recording spreads 8 tracks over 2 LPs and CDs (no cut shorter than 8:24) while Mr. Newsome's program runs around 54 minutes (no cut longer than 4:16 and 8 under 1:51). The saxophonist delves into the rich wellspring of the music from the African continent with tracks such as the pair of hypnotic dances "The Obama Song: The Man From Kenya" and "The Snake Charmer of Tangier" (hear below), the funky "Good Golly Miss Mali", and the birdsongs of "Sounds of Somalia" (played in the higher registers of the instrument and sounding like an orchestra of flutes.) He pays tribute to the Falasha community of Ethiopia on "Ethopian Jews" and creates swirling rhythmical lines on "African Nomads." The playfulness of "When The Drum Speaks" and "Nightfall on the Owani Desert" sets the stage for the final track for the dancing sounds of "Highlife", a delightful romp over the "clicking" rhythms. There are more "experimental" pieces, such as the striking "Dark Continent Dialogues" and the 4-part "Microtonal Nubian Horn" spread around the second half of the program. And, as one listens to these pieces, the sound of fellow soprano master Evan Parker might come to mind, especially the more hypnotic of melody lines such as the one the latter musician recorded on his 2006 Tzadik CD, "Time Lapse." But, like Julius Hemphill before him and his contemporary Evan Parker, Sam Newsome continues to carve his own pathways through the world of music. Much of the music on "The Straight Horn of Africa: The Path to Liberation" is exhilarating, making one return to this adventure time and again. For more information about the man and his music, go to sopranosaxtalk.blogspot.com. Also, check out this excellent interview with Mr. Newsome from the Wing Walker Music podcast: www.wingwalkermusic.com/2014/12/36-sam-newsome/. The Side Door Jazz Club in Old Lyme welcomes back Cuban-born pianist Manuel Valera on Saturday December 13. This time, he brings his very active Trio, an ensemble that includes the fine bassist Hans Glawischnig and the exciting drummer EJ Strickland (the twin brother of saxophonist Marcus Strickland.) Valera has had a busy 2014, releasing a splendid solo piano CD (my review here) and a powerful Criss Cross recording with his septet The New Cuban Express. The Trio plays all sorts of music, from blues to Latin to Cuban to "straight-ahead piano trio music." The Side Door opens at 7:30 p.m. and the first set starts at 8:30. For more information, go to thesidedoorjazz.com or call 860-434-0886. Lee Konitz is playing this Friday night (12/12) at Firehouse 12 in New Haven with a quartet that features bassist Jeremy Stratton, the great drummer George Schuller and the wonderful pianist Alan Broadbent. It's the ultimate concert in the venue's Fall 2014 Concert Series and both sets are sold out (have been for awhile). There's a waiting list so call 203-785-0468 or go to firehouse12.com. Can't hurt trying. In a Fall Concert series that has been one of the strongest (schedule-wise) in its existence, Firehouse 12 in New Haven presents the season's penultimate show this Friday (12/05) and it's a doozy. Trumpeter/composer Jonathan Finlayson, who works alongside and has studied with Steve Coleman, bring his Sicilian Defense to the performance space for 2 sets of exciting new music. 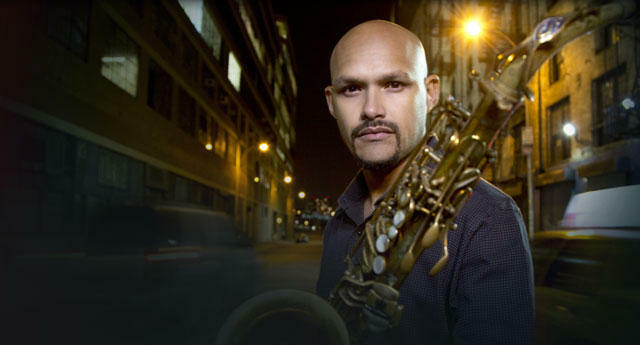 The 32-year old native of Berkeley, CA, has performed at the Firehouse before in ensembles led by guitarist Mary Halvorson and saxophonist Steve Lehman (both graduates of Wesleyan University) as well as the great Henry Threadgill. His 2013 debut with his Quintet, "Moment and the Message" (Pi Recordings), was a forceful collection of original material and features the band he'll work with in this concert including David Virelles (piano), Miles Okazaki (guitars), Keith Witty (bass, electronics) and Damion Reid (drums). Expect this music to go in various exciting and surprising directions. The first set that Jonathan Finlayson & Sicilian Defense will play is at 8:30 p.m. and is followed by a 10 p.m. show. For more information, call 203-785-0468 or go to firehouse12.com. To learn more about the young composer/musician, go to pirecordings.com/album/pi48. The "Improvisations" series at Real Art Ways, 56 Arbor Street in Hartford, continues its impressive streak of collaborations featuring curators Stephen Haynes (cornets) and Joe Morris (guitar, bass) this Sunday (12/07) at 3 p.m. Joining the dynamic duo is drummer and percussionist Chad Taylor. The Arizona native grew up in Chicago where he first played with the legendary saxophonist Fred Anderson and bassist Malachi Favors (of the Art Ensemble of Chicago.) In 1997, he and trumpeter/conceptualist Rob Mazurek started the Chicago Underground Duo (adding guitarist Jeff Parker a few years later), a group that reunites every year (although the trumpeter now lives in Brazil). He also has worked with saxophonist Matana Roberts in the trio Sticks and Stones and is currently a member of guitarist Mark Ribot's Trio with the great bassist Henry Grimes. Taylor also is a member of Digital Primitives as well as bassist Eric Revis's Quartet. Chad Taylor is well-known for his creativity as a percussionist; he can play as hard as anyone in creative music but also has a softer touch that really pulls the listener in. This show should be quite enjoyable and exciting. For more information, go to www.realartways.org or call 860-232-1006. Igor Stravinsky is enjoying a comeback in 2014, specifically his ground-breaking work "The Rite of Spring." The piece debuted in Paris in May of 1913 as the score for a ballet choreographed by Serge Diaghilev, director of the Ballets Russes. The evening of the debut was marked by the audience reacting violently, although more to the "violent" nature of the dancers than to the fiery music and, within a few nights, the "riots" were replaced by riotous applause. Earlier this year, The Bad Plus issued their take on Stravinsky's score and now guitarist/arranger Eric Hofbauer has created an arranged for his Quintet. The Boston-based Hofbauer has gone TBP one better by pairing "The Rite.." with his arrangement of Olivier Messiaen's "Quatuor Pour la Fun du Temps" and titling the work "Quintet for the End of Time" (more on that music below), releasing both CDs on his Creative Nation Music label. The music is arranged for guitar, trumpet (Jerry Sabatini), clarinets (Todd Brunel), cello (Junko Fujiwara) and drums (Curt Newton). Hofbauer calls the project "Prehistoric Jazz: Volumes I & II", taking the monicker (as the guitarist writes on his website) "inspired by video footage of Leonard Bernstein rehearsing "The Rite of Spring" in 1987 where he instructs the timpanist to play like “prehistoric jazz.” The arrangements allow the band to play in numerous styles from early New Orleans to avant-garde to Chicago-style free. The "Rite.." opens with Brunel playing unaccompanied and sliding down into the recognizable melody like Gershwin's "An American in Paris" in reverse. Ms, Fujiwara moves easily from pizzicato to arco, often locking in with the creative work of Newton to truly drive the piece. Sabatini's trumpet tone is quite clean war he plays "open bore" and pretty funky when he employs a mute. Hofbauer's hollow-body electric guitar mixes the earlier styles of Freddie Green and Charlie Christian with stylistic hints of Mary Halvorson and Joe Morris. The guitarist's approach to the material allows the original music to breathe and expand without losing its power. The musicians seamlessly blend the written and the improvised music. Make sure to listen to "The Rite of Spring" in one sitting to get the true scope of what the Hofbauer Quintet is doing with Stravinsky's music and how the seemingly disparate elements fit. There is great power here as well as humor and an occasional touch of pathos. The Messiaen work, composed when he was in a German prisoner-of-war camp in 1940 and premiered in the camp in January 1941 by a quartet of prisoners playing piano, cello, clarinet and violin. The composer, who was a devout Catholic, intended the piece as a work of hope - yes, some of the music is often dissonant as if the war raging around Europe had stolen the beauty of the artist's creation. Yet, there are also many contemplative moments as if music could shut out the horror by the simple act of playing the notes. The original work was written over a period of time including sections composed before Messiaen's imprisonment. Even in Hofbauer's arrangement, there are moments that stand out as odd, such as the funky "Intermede", which is the most joyful of pieces. Much of the work is uncluttered, with long stretches of quiet interplay for 2 or 3 instruments. The blend of cello and guitar really stands out, on the plaintive melody on "Louange A L'eternite De Jesus" which is played by Ms. Fukiwara supported by the sparse, nearly inaudible (at times, guitar chords. Hofbauer's creative work beneath the searching, keening, clarinet on "Abime Des Oiseaux" is fascinating as is his interaction with Sabatini on "Louange A L'immortalite De Jesus" (with Newton's percussive colors all quietly in support.) The arranger finds the heartache in "Foullis D'arcs-en-ciel", the piece taking on the feel of a New Orleans traditional blues before the Quintet literally turns "Pour L'ange Qui Annonce La Fin du Temps" into a nontraditional "second line." It's really hard to choose one volume over the other so be wise and purchase both. 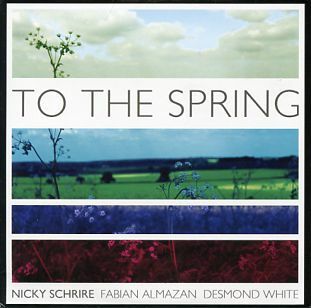 This music will bring you hours of pleasure as you listen to the care and attention Eric Hofbauer put into making "The Rite of Spring" and "Quintet for the End of Time." While it's clear the Quintet can and does play with great virtuosity, this music is also emotionally strong and heartfelt. If this is "prehistoric", it's also timeless. Pay attention and the rewards will be many. Also, David Adler deserves major kudos for his superlative and comprehensive liner notes. Listen to the music first, then read Mr. Adler's excellent essays (one for each CD). For more information, go to erichofbauer.com. After a long day, what could more relaxing than curling up with a glass of wine and Melissa Stylianou. It's quite possible husband Jamie Reynolds (the fine pianist/composer) might get a bit of jealous but, honestly, I was thinking of Ms. Stylianou's delightful new CD, "No Regrets" (Anzic Records). Produced by Oded Lev-Ari and recorded live to 2-track by James Farber in one day-long session, Ms. Stylianou is joined by a splendid trio of musicians - Bruce Barth (piano), Linda Oh (bass) and Matt Wilson (drums - plus guests Anat Cohen (clarinet on 2 tracks) and Billy Drewes (alto saxophone on 2 different tracks). This is her 5th CD (2nd for Anzic) and is comprised of 9 standards, a smashing take on Thelonious Monk's "I Mean You" and a spellbinding duet with Wilson on William Yeats' "Down By The Salley Gardens." What stands out are the intelligent arrangements, the duet tracks, and the wonderful vocals. If one has listened to jazz singers for any length of time, you have heard some of these songs dozens of times (if not more). Listen to the pleasing take of "I've Got It Bad" for Drewes' exciting alto work, the solid support of the trio and how Ms. Stylianou does not oversell the song. She's right into the emotion of the love song. Drewes digs deep into the blues on the delightful "A Nightingale Can Sing the Blues" Same approach with "Polka Dots and Moonbeams" except here it's Barth's ever-so-melodic support than frames and interacts with the vocal. Ms. Cohen's clarinet is at its bluesy best on "I'll Never Be The Same", one of 2 tracks associated with Billie Holiday. It's just voice, clarinet and Ms. Oh's expressive bass on the other Holiday treat, "Somebody's On My Mind." The subdued arrangement, the sweet clarinet phrases and the intimate vocal gives the piece a timeless quality. Ms. Oh, who seems to be showing up on every 3rd CD I receive (no complaints here), opens the Mack Gordon-Harry Warren swinging "I Wish I Knew" by herself and then delivers a knock-out solo in the middle. The program is bookended by 2 uptempo pieces, the sprightly "Nice Work If You Can Get It" (yes it's a love song but feels like a commentary on the session) and the cheerful duet with Barth on the Monk tune. While it's the final track, it's no leftover. The duo dig right into with Barth matching the vocalist note for note and laying a forceful and tuneful solo. Then, Ms. Stylianou "trades 4s" with the pianist, her playful scatting bringing the tune to its final verse and this delightful album to a happy close. You should have "No Regrets" in your life - judging by this classy production, Melissa Stylianou and her friends don't seem to. This recording is like a warm fire on a chilly night, making you more comfortable, relaxed and satisfied. Can't ask for more than that! For more information, go to www.melissastylanou.com or anzicstore.com/album/no-regrets. Thanksgiving 2014 - To Life! As many of us sit down to a table of plenty, whether with family and friends or with a congregation, it's easy to put out of our minds those living through this holiday who don't have family, who do not have enough or who do not have good health. Imagine the families of Michael Brown in Ferguson, MO. or Officer Darren Wilson and how their lives at this moment in time are so turbulent and tragic. Say a prayer for those soldiers who are in Afghanistan or elsewhere in the world protecting our right to enjoy the fruits of the harvest. Take the time to wonder what it must be like to be a police officer in the United States or an immigrant picking fruits and vegetables in the Central Valley of California or stuck in detention centers in the Southwest. All around this country (and the civilized world), people celebrate the "good old days", as if that's what they really were. History has a way of evening out the lows and boosting the highs; our memories do the rest. Sure seemed to be simpler times when I was a boy in the 1950s but what did I know of the issues in the Deep South? President Kennedy was assassinated when I was in high school, Malcolm X less than 16 months later, and Dr. King and the President's younger brother Robert in 1968. Detroit, Los Angeles, and other cities burned from the inside out and "white flight" became a serious reality. The Vietnam war raged on for over a decade, turning brother against brother. Drug use and abuse started to go "mainstream" in the 60s and shows no inclination to disappear. The rich got richer, the poor poorer and those in the "middle" started a long, slow, slide downward. Politics became sport, sports became religion and religion became passé or devoutly evangelical. For me, I hid behind the "sounds" for the longest time, preferring to retreat to the vinyl grooves or the CDs for solace and a reminder of what I believed real brotherhood could be. Took a long time to realize that hiding is just another excuse for doing nothing but I have gone on to be involved in my communities. Haven't changed anyone's world other than my immediate family's but that is where true change begins. Enjoy this Holiday season but do try and give back in any way that you are able. 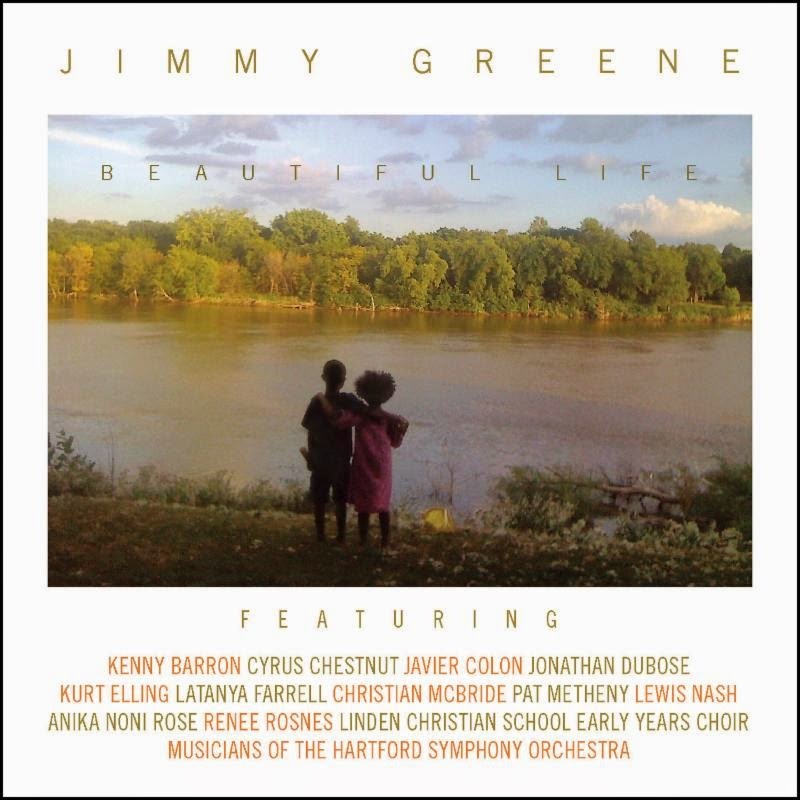 Most readers and listeners know the events and the long road that lead to "Beautiful Life" (Greene Music Works/Mack Avenue Records), the new recording by saxophonist, composer, and educator Jimmy Greene. Both of his children were in attendance at the Sandy Hook Elementary School the day that a mentally disturbed young man forcibly entered the building and killed 26 people, 20 children and 6 teachers/administrator. Jimmy Greene and his wife Nelba Marquez-Greene lost their daughter Ana, aged 6 years old. Those of us who live in Connecticut were glued to the news outlets that mid-December 2012 weekend, shocked, saddened and angered. Greene, a native of Bloomfield, CT., had attended the Jackie McLean Artists Collective during high school and gone on to the Hartt School of Music at the University of Hartford and performed throughout the area, ultimately taking a teaching position in Winnipeg, Manitoba, Canada. Just months before Ana's untimely death, Greene had moved his family back to Connecticut upon taking a position at Western Connecticut State University. The music pays tribute and looks forward without ever becoming maudlin or mawkish. Pieces such as "Last Summer" and "Seventh Candle" are filled with buoyancy and joy, the former featuring a sparkling solo from Ms. Rosnes and the latter featuring strong work from Greene on soprano sax and bassist McBride. Both cuts show Lewis Nash at his best, propelling the music forward on waves of cymbals. Kenny Barron plays 2 duets with the leader, the sublime "Where Is Love" (from Lionel Bart's score for the play "Oliver") and the achingly tender "Maybe" (from "Annie"). The latter track finds Greene on soprano, hewing close to the melody his daughter loved to sing. Javier Colon sings Greene's stunning "When I Come Home", his handsome tenor blending with with the leader's feathery yet substantial tenor saxophone phrases. Elling's voice shines on "Ana's Way", which describes the child's zest for living and love of family - when the Children's Choir enters, the song shimmers. Hartford-area resident and family friend Latanya Farrell delivers a powerful vocal on "Prayer", a setting of "The Lord's Prayer" for quartet and strings. Anika Noni Rose, also a native of Bloomfield, speaks Greene's powerful message of hope, forgiving and love on the final track "Little Voices" with Greene overdubbing flute, soprano and tenor saxophones over the Children's voices repeating "Remember me" as the song fades. "Beautiful Life" is a powerful album, a beautiful reminder of a spirit removed far too soon from her earthly existence. 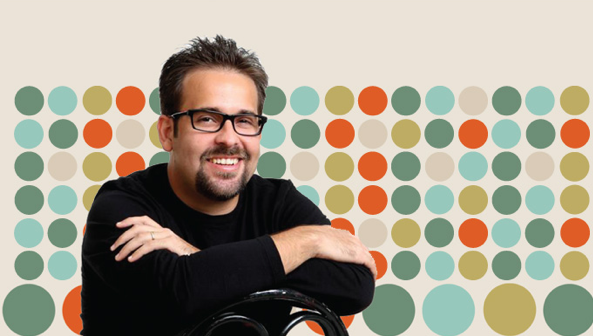 Instead of grief, Jimmy Greene focusses on joyous memories, on healing, on beauty and on hope. As a parent myself, I am brought to tears by the loving care that Greene put into this program, making very sure that there was no anger expressed, no vitriol towards the troubled young man who changed the family forever. One is humbled by the Greene family's deep faith and insistence that, despite all the pain, horrific images, and tragic loss, love wins. A portion of the proceeds from "Beautiful Life" will go to The Ana Grace Project of Klingberg Family Centers (anagraceproject.org) and The Artists Collective (artistscollective.org). For more on Jimmy Greene and his music, go to www.jimmygreene.com. In the summer of 2008, pianist/composer Fred Hersch contracted a particularly vicious case of septic pneumonia. Earlier that year Hersch, who has been HIV-positive since the mid-1980s, had been in the midst of a particularly busy touring schedule and had lost a lot of weight. He stopped eating and his doctors decided to take him off the antiviral medication to give his body a rest. He did start to eat again but the HIV flared up, causing an infection in his brain and creating AIDS-related dementia. By June, he went into septic shock, his organs shut down one-by-one and Hersch fell into a coma that lasted more than 2 months. When his doctors brought him out of the coma, be could not talk, eat, swallow, had no power over his limbs and he, in his own words, "had to completely rebuild himself." Fred Hersch returned to performing in late 2009 and released his first new Trio recording in 2010, "Whirl." The musicality we had come to expect from his performances seemed to be intact, his solos strong and inventive and his interactions sharp. He also began work on a long-form piece taken from the dreams he had during his coma. Working with lyricist Herschel Garfein, the composer created a work he calls "My Coma Dreams", a work of theater for Trio (bassist John Hebert and drummer John Hollenbeck), a 4-piece brass and reed section (trumpeter/flugelhorn Ralph Alessi, trombonist Mike Christianson, clarinetist and alto saxophonist Bruce Williamson, plus the flute, clarinet and tenor sax of Adam Kolker and a string quartet (Joyce Hammann on violin and viola, Laura Seaton on violin, Ron Lawrence on viola and Dave Eggar on cello). 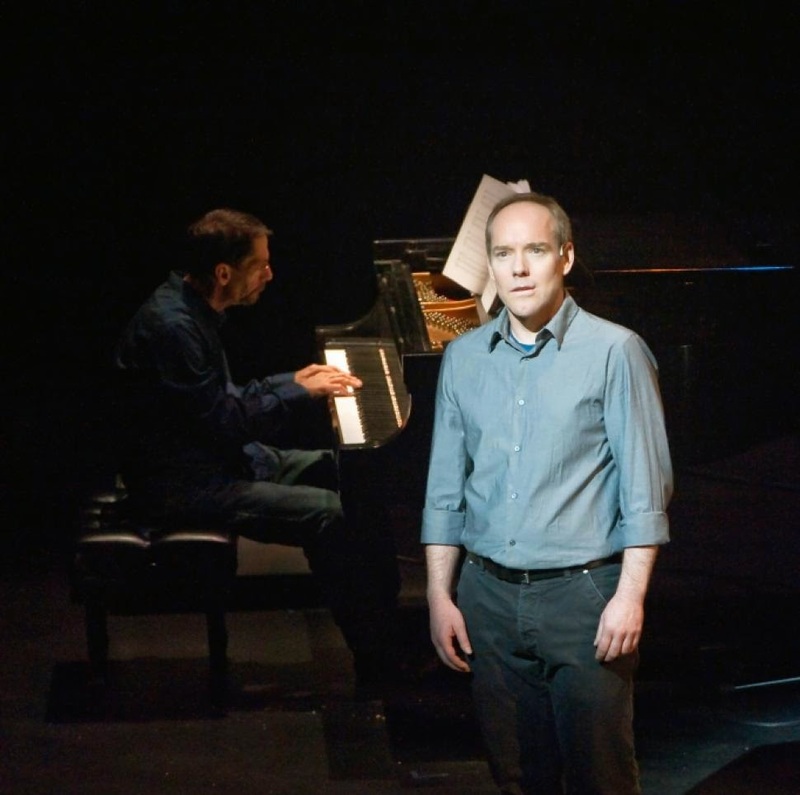 Playing the roles of narrator, Hersch, his partner Scott Morgan and more is the incredible Michael Winther - he is the connecting tissue of the work, the face and voice of the dreams, and the focus of our attention. Palmetto Records has issued the DVD of "My Coma Dreams" taken from the live performance at Miller Theatre on the campus of Columbia University in March of 2013. The 87-minute production includes animation and graphic design by Sarah Wickliffe plus the brilliant video system design of Eamonn Farrell and sound design of Jody Elff. Not only do the words tell the story but Hersch's music takes us through the experience as well. What stands out to the viewer is that, for Hersch, the experience is not grim - scary certainly, but these dreams have humor, are filled with music and images that are cinematic. Scott Morgan is the one doing the suffering. But, also the person doing the caring, the sitting, the holding, the praying and he emerges from the narrative as the "hero" - he never gives up hope even as his partner is just lying there being kept alive by machines and the doctors refuse to give prognoses. The music that Hersch provides for this work of "Jazz Theater" is, not surprisingly, quite impressive, ranging from blues to classical interludes to duets to Monk's "I Mean You" (there's even a dream starring Monk and one wonders if Hersch's unconscious mind channelled the final years of Thelonious Monk's life which he spent in the apartment of the Baroness Pannonica de Konigswarter.) When Winther sings "The Knitters", his excellent voice stands out as he tells the story of Hersch watching women - perhaps Amish women - as they work on various projects, only communicating in whispers. As the song transitions, the story changes to Hersch and his brother watching his parents and their friends talking, interacting and the young boy wonders if his "fate is being knitted in the room below." Meanwhile, the horns and strings play this expanding arrangement, their sounds wrapping around the voice like a warm sweater. "Jazz Diner in the Woods" is a tour-de-force for all involved (John Hollenbeck truly knows how to drive an ensemble), a swinging track that is an audience favorite. In the final analysis, "My Coma Dreams" is about time lost but life regained. Though Fred Hersch seemed lost to the world, his "inside" appears to be quite alive. He admits early in the performance that these dreams may have occurred as he was either going into or coming out of the coma. The live performance is smartly captured - like many videos of live shows, one can't help but wish he had been in attendance yet this story grabs ahold from the opening minutes and, even though one knows the eventual outcome, the solo piano piece that represents the composer coming out of his coma state still brings tears. Fred Hersch has returned to performing on a full-time basis and continues to create music in which one feels great emotion, a strong sense of swing, and beautiful lines of melody. We are such lucky people that he has survived, he thrives and he educates us on just how precious time and life are. For those who believe that there is no hope for their situation in life, know that there are foundations, doctors, nurses, therapists and others who are trained to bring you back from the brink. A portion of the proceeds from the sale of "My Coma Dreams" will go to Treatment Action Group (www.treatmentactiongroup.org). To find out more about Fred Hersch and this production, go to www.mycomadreams.com. Depending on which hemisphere one lives in, November can be an awfully cruel month. The hours of daylight lessen, the winds often howl, snow and/or ice can surprise you at any time, and the prospect of 4-5 months like this weighs on some heavily. Yet, there is the holiday season, opening in the United States with Thanksgiving and moving through until and after the New Year arrives. The CDs and DVD below are excellent companions for the darker times. Jason Yeager is an articulate pianist, an impressive composer, and yet another splendid graduate of the music programs at the New England Conservatory of Music in Boston, MA. He also graduated from Tufts University with a B.A. in International Relations. While at NEC, he studied with Danilo Pérez, Fred Hersch, Jerry Bergonzi, Frank Carlberg, John McNeil, and Ran Blake. Since graduating, he has gone on to serve on the faculties of the Berklee School in Boston and the Varta Academy of Musical Arts in New York City. Yeager is also a busy sideman, working in numerous groups of all sizes. "Affirmation" is the pianist's 2nd release on Inner Circle Music, the first being 2011's "Ruminations." Recorded with his regular rhythm section of Danny Weller (bass) and Matt Rousseau (drums) - both NEC grads - the 12 tracks range from introspective ballads to playful uptempo romps. Vocalist Aubrey Johnson (yes, an NEC grad as well) appears on 2 tracks including the lovely title track that closes the program, a piano/wordless vocal duet that contains shades of Norma Winstone's work with pianist John Taylor. Ms. Johnson joins the Trio for a lovely take on John Lennon's "Julia", the only Beatle song that Lennon recorded all by himself. While this version hews closely to the original, the piano solo stretches out while Weller plays counterpoint and Rousseau quietly stays on the beat. Tenor saxophonist Noah Preminger (NEC grad, too) adds his lyrical playing to "Smiled First", his sometimes deliberate, other times sprightly phrases wrapping around the active bass and drums. Yeager is an impressive accompanist throughout the program; here, his full chordal backing beneath the tenor sax really fills out the sound. That 4-some stretches to 5 with the addition of trumpeter Jean Caze (a graduate of both the Manhattan School of Music and the graduate program at Florida State University) for the dancing "Keep The Fire." Rousseau's driving percussion and Weller's melodic bass lines propel the piece forward. Caze switches to flugelhorn for the handsome ballad "Aurora", a smartly constructed piece (dedicated to the victims and families of the tragic events in both Aurora, Colorado and Newtown, Connecticut), is a beautiful melody that is both impressionistic and elegiac without being treacly. The Trio tracks all stand out, from the Thelonious Monk-like "Blues for Billy P" to the gentle medium tempo "Achi" to the pianist's adaptation of Olivier Messiaen's "Dance of Fury, For the Seven Trumpets" (from the composer's prisoner-of-war composition "Quartet for the End of Time".) That last track includes more impressive interplay and a great sense of urgency. "Twelve Etude" is a dedication to percussion master Jerry Leake, with all 3 musician sharing percussive lines and melodic phrases. "Affirmation" sparkles with intelligence and impressive musicianship; the Jason Yeager Trio plus guests never substitute technique for talent and these 12 tracks This music gives off a warmth that can transcend any dark day or night. For more information, go to www.jasonyeager.com. "Post No Bills" is the 4th recording pianist and composer Greg Reitan has recorded for the Sunnyside label as well as the 4th to feature his Trio of bassist Jack Daro and drummer Dean Koba. From their initial collaboration, 2009's "Some Other Time", it's been clear that these 3 musicians interact on an intuitive level and have built a strong union. This new recording features 10 tracks, 3 Reitan originals and the rest a fascinating blend of standards and pieces by fellow pianists (but nothing by Bill Evans - perhaps that's what the name of the CD refers to?) The program opens with Keith Jarrett's "The Mourning of Star" (from the pianist's 1971 Lp of the same name). Reitan and company speed up the piece a bit yet do a fine job interpreting the melody, a blend funky phrases and long flowing lines. There's a pleasing rendition of Joe Sample's soulful "One Day I'll Fly Away", a emotionally rich "Lonely Woman" (the Horace Silver composition) and whisper-soft yet forceful take on Denny Zeitlin's "After The War" (from that composer's 1965 "Carnival" Lp). Chick Corea's "Windows" rounds the pieces by composer/musicians who are influences in Reitans approach to Trio playing as wells his compositional style. The Corea piece gives the Trio the opportunity to stretch out and swing which they do quite nicely. The oft-recorded "Stella By Starlight" opens with a blues-drenched unaccompanied bass solo then bursts into an energetic take on the piece (including a lively spot for drummer Koba). The Trio then delivers a soft and emotional take of "I Loves You, Porgy", a track that contains, arguably, the pianist's most melodic solo on this disk. The 3 Reitan originals range from the inspired 2-sectioned title track (an impressionistic piano solo opening followed by a jaunty Trio romp) to the bluesy "Spring" (excellent bass solo after an animated piano solo) to the handsome "Solitude" that closes the program. Again, bassist Daro delivers a strong solo before Reitan's lively solo belies the song's title and thematic material. "Post No Bills" may actually remind listeners of the Bill Evans Trio with Scott LaFaro and Paul Motian, especially in the way Greg Reitan utilizes the melodic strengths of Jack Daro and steady support of Dean Koba. This is a recording where melody reigns supreme and where the Greg Reitan asks nothing more than you sit and enjoy their play. For more information, go to www.gregreitan.com. I treated myself to a copy of "Arrows Into Infinity", the new ECM DVD that serves as a musical biography of saxophonist, composer and spiritual seeker Charles Lloyd. The film, created by Lloyd's long-time partner Dorothy Darr and producer/co-editor Jeffery Morse, is an overview of Lloyd's life, starting from his youth in Memphis, Tennessee, to his musical adventures with Chico Hamilton and the Adderley Brothers and them onto his long and varied solo career. Interviews with Jack DeJohnette, Michael Cuscuna, Robbie Robertson, John Densmore (of The Doors) and Staney Crouch help shed light on his Atlantic years while Blue Note-head Don Was joins to talk about the albums before Lloyd went into seclusion. There are great videos from the earlier days as well as Lloyd's honest assessment of why he stepped away. It was at the prodding of the late pianist Michel Petrucciani that Lloyd began to move back into the world of performance in 1981 and played/recorded in a quartet with Buster Williams, Cedar Walton and Billy Higgins in 1983. One moment of the film stands out for me and that is Alicia Hall Moran's stunning rendition of "Go Down Moses", recorded live in concert at Wesleyan University in Middletown, CT, (where I live). I was lucky enough to be in attendance that night and have always felt that Ms. Moran's vocal was the emotional highpoint of a great performance. I'm happy to see it here and relive that moment again. Charles Lloyd does not rest on his laurels, continuing to play and grow, to mentor musicians around the world and to keep on bringing light to an increasingly darker world. "Arrows Into Infinity" will please his fans and help newer converts understand why those of us who first discovered his music in the 1960s are still listening intently and with great joy. 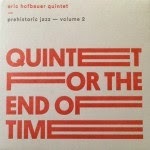 For more information, go to www.ecmrecords.com/Catalogue/ECM_Cinema/5052_DVD.php. 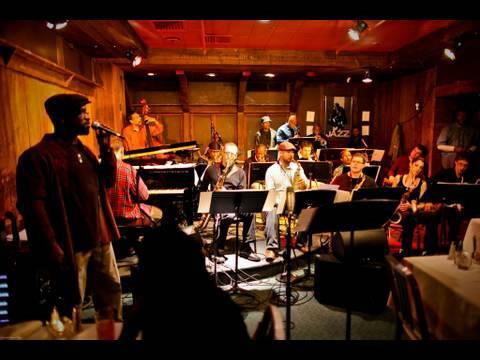 The impressive multi-instrumentalist and communicator Nicholas Payton returns to The Side Door Jazz Club in Old Lyme this weekend for 2 nights, Friday and Saturday 11/21-22. The 41-year old native of New Orleans is best-known as a trumpeter but also plays trombone, saxophone, clarinet, bass and, in his Trio, keyboards. He's been touring and recording with his Trio - Vincente Archer (bass) and Bill Stewart (drums) - for the past several years, releasing one CD, "#BAM: Live at the Bohemian Caverns" on his PAYTONE Records (the recording features Lenny White on drums). Payton is adamant about not using the word "jazz", especially for its derogatory and narrow definition, preferring to call his music "Black American Music." And, if you have followed his career, he can and does play many styles of music, from the early days of Louis Armstrong to Thelonious Monk to funk to classical to a wonderful recreation of the Miles Davis/Gil Evans collaboration "Sketches of Spain." He's a splendid and inventive soloist, a thoughtful and incisive writer, plus his gigs are great fun. Doors open at The Side Door at 7:30 p.m. with the Trio taking the stage for the first set at 8:30. 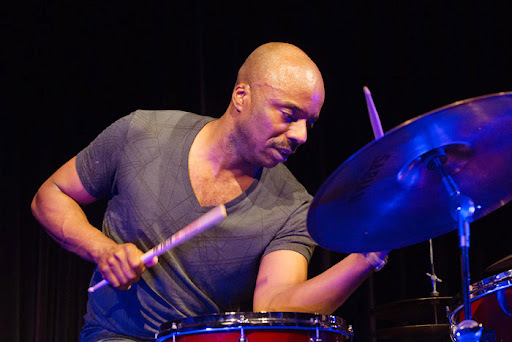 For this date, the fine young drummer Joe Dyson (Branford Marsalis, Stefon Harris, Esperenza Spalding) joins Payton and Archer so expect the music to have plenty of propulsion. For tickets, go to thesidedoorjazz.com or call 860-434-0886. Check out Nicholas Payton at www.nicholaspayton.com. The New York Times published a fine article about The Side Door in its Metropolitan section this past Sunday (11/16) - you can read it by clicking on www.nytimes.com/2014/11/16/nyregion/an-ear-for-jazz-and-a-nose-for-business.html?_r=0. Pianist Myra Melford is no stranger to Firehouse 12, 45 Crown Street, in New Haven. This Friday (November 14) marks her 6th appearance as a performer, 4th as a leader or co-leader. For clarinetist Ben Goldberg, this is his initial appearance as a performer. He appears on the venue's record label as a member of Ms. Melford's Be Bread ensemble, the quintet that released "The Whole Tree Gone" in 2010. In 2013, Firehouse 12 Records also released the pianist's brilliant solo CD "Life Carries Me This Way." Ms. Melford is no stranger to the duo setting, having recorded 2 fine CDs with reed master Marty Ehrlich and one each with drummer Han Bennink, violinist/violist Tanya Kalmanovitch and fellow pianist Satoko Fujii. She has distinguished throughout her career (which is well into its third decade) as a thoughtful and fearless composer, an exciting soloist and an as a performer who follows her music, whether it be working in large and small ensembles, studying in faraway countries or working in multimedia. Goldberg, who grew up in Denver, Colorado, has played clarinet met of his life. He first came to critical notice in the early 1990's as a member of The New Klezmer Trio, an ensemble that recorded 3 CDs for John Zorn's Tzadik label, broke up in 1996 and reunited in 2009 for a recording that celebrated the life of Goldberg's father. He's a member of the avant-classical group Tin Hat and has released numerous recordings as a leader or co-leader, the latest being a trio recording of Thelonious Monk compositions with guitarist Adam Levy and drummer Smith Dobson - titled "Worry Later", the download only album appears on Goldberg's BAG Productions label. 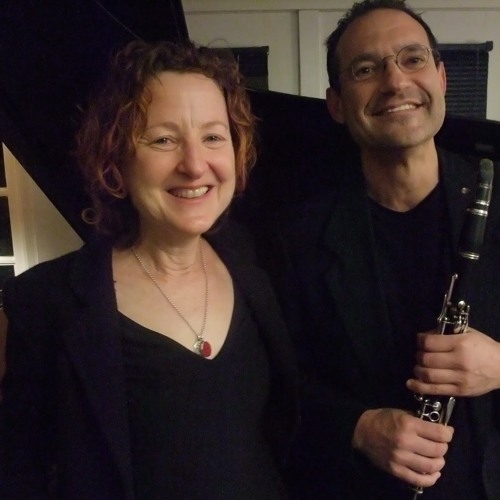 The Melford-Goldberg duo has been working and creating together for 5 years and, although they have yet to release a CD, you can see and hear excerpts from their 2013 European on the pianist's website (click here) and several more on the SoundCloud page created by the clarinetist (click here). They'll play 2 sets - 8:30 and 10 p.m. - you'll enjoy the intimacy of their musical interactions as well as how adventurous and melodic the music can be. For ticket information, go to firehouse12.com or call 203-785-0468. To find out more about the duo, go to www.myramelford.com/projects/project/display/id/3/::Dialogue::. 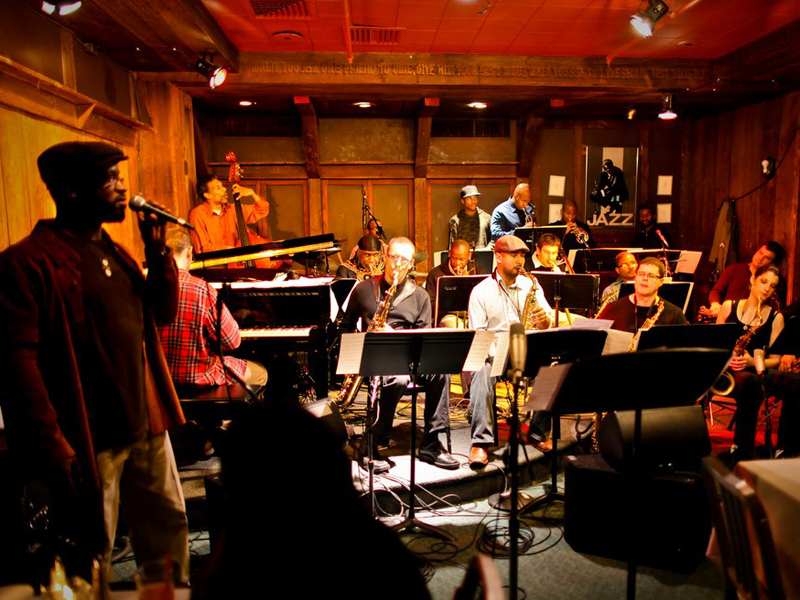 It's been nearly 3 decades since Wayne Horvitz wrote and performed with the New York Composers Orchestra, a large ensemble that commissioned works from numerous composers (Anthony Braxton, Lenny Pickett, Butch Morris and others), playing the pieces and more in concerts around the world. Mr. Horvitz and his wife, the composer Robin Holcomb, moved to Seattle, Washington, in the late 80's and, while he has composed for orchestras and large ensemble, his latest for Songlines Recordings "At The Reception: The Royal Room Collective Music Emsemble" is his first for a "big band" since the NYCO days. This 14-member ensemble, composed of musicians from the Pacific Northwest, may not have many recognizable names (one exception would be tenor saxophonist Skerik) but they play this music with great joy and abandon. The all-original program, split into "Side A" (7 tracks) and "Side B" (6 tracks), opens with "A Walk In The Rain" that shows the influence of Billy Strayhorn and Duke Ellington, an opinion strengthened by the strong trombone solo of Naomi Siegel. The funky rhythm section - Ryan Burns (piano), Geoff Harper (bass) and Eric Eagle (drums) - keep the piece on track while the sections interact behind the combined solos of Skerik and trombonist Jacob Herring. The next 6 songs feature plenty of group interaction and very few solos, ranging from the lovely ballad "Forgiveness" (it's a treat to hear the reeds dancing around the brass figures in ways that remind this listener of the music of Ms. Holcomb) to "Daylight" with its quiet rubato opening to the sudden explosion of sound. Again, the reeds carry the melody until they begin to furiously challenge the brass. "Barber Shop", with its English Music Hall bouncy rhythm, replaces the Strayhorn with a blend of Ray Davies (around the time of "Village Green Preservation Society") as well as a Bavarian Gilbert & Sullivan brass section. There's a touch of Anthony Braxton and Muhal Richard Abrams' circular melodies, rhythmic variations and section interaction on "Ironbound." "Side B" opens with "Prepaid Funeral", a swirl of horns, reeds and rhythm section sprinkled with fine solos, sounding like the work Bob Brookmeyer did with the New Art Orchestra in the first decade of the 2000s. The solos grow naturally out of the section interplay. Unlike the majority of the tracks on "Side A", most of these songs have solos. "Sweeter Than The Day", which is also the name of a quartet Horvitz led from 1999-2008, has a melody and harmony feel of Randy Newman and Robbie Robertson - the quartet version came be heard on the group's 2002 Songlines CD (which also contains "Ironbound.") 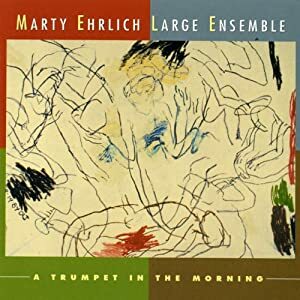 "Disingenuous Firefight" (also recorded by STTD on its 2000 debut) marries a boppish groove to a mysterious descending line while Al Keith (trumpet) and Ms. Siegel play above the band (there's a touch of Carla Bley's music in this tune). Back into an Ellington and Basie groove for the title track, which features strong solos from Steve O'Brien (trumpet), Kate Olson (soprano saxophone) and Beth Fleenor (clarinet). "At The Reception" is a delightful large ensemble recording, depending more on Wayne Horvitz's intelligent arrangements and well-crafted songs than on solo after solo. The section writing is truly delightful. During his career, Wayne Horvitz has rarely stayed in the same mode for long periods of time but does like to rearrange his material for different groups. The Royal Room Collective Music Ensemble is quite a treat, not only for aficionados of his music but for fans of contemporary big band music. For more information, go to songlines.com/release/at-the-reception/ - there are even a pair of bonus tracks. It's been nearly 15 years since pianist/composer Frank Kimbrough recorded an album as a leader that also featured a reed player (Scott Robinson appeared on 2000's "Noumena"). His 6th release (7th, if you count the digital-only reissue of "Chant") for Palmetto Records is aptly "Frank Kimbrough Quartet" and finds the pianist in the company of drummer Lewis Nash, bassist Jay Anderson and saxophonist Steve Wilson (alto and soprano) - the latter 2 musicians also play alongside Kimbrough in the Maria Schneider Orchestra. All 4 are members of Ryan Truesdell's Gil Evans Project. Judging by the opening 2 cuts, "The Call" and "Blue Smoke", the addition of Wilson has opened up the possibilities for Kimbrough's music. Both pieces have great forward motion with the former having a strong blues feel while the latter swings with abandon. The composer's Southern roots (he was raised in North Carolina) are quite evident on "Kudzu" - Nash's work is quite "groovy" while Anderson's thick tones create a solid foundation for the soloists. Still, there are few who play an introspective ballad as well as Kimbrough and this CD has several excellent additions to his repertoire. "Trouble Man" (the Kurt Weill composition, not the Marvin Gaye one) is a lovely piece, framed intelligently by Nash's cymbal work and Anderson's melodic bass work. Wilson's soprano lines are filled with sweetness and a generosity which one also hears on the closing track, the Rodgers & Hart gem, "It Never Entered My Mind." There is a bluesy touch to Wilson's lines as well as a sparkling bass solo - Kimbrough states the melody at the beginning and as the piece closes. Otherwise, his sensitive support and Nash's splendid brush work give the saxophonist and bassist wings to soar. The Quartet jumps right into John Lewis's "Afternoon in Paris", everyone at his melodic best (yes, even Nash.) It's fun to hear these musicians move from the solo piano introduction of the melody into the body of the piece and realize how "free" the music becomes. Kimbrough supports the lyrical saxophone while Anderson and Nash play around beneath them. During the long piano solo, the rhythm section continues to play outside the form and, damn, if that's not exhilarating. "Frank Kimbrough Quartet" is what one has come to expect from the pianist and more. Melody, rhythms, group interactions, sensitive ballads, and utter joy. The liner notes say that the CD was culled from one 6-hour session at Systems Two in Brooklyn, NY. O, what fun they must have had! If you like music that takes chances and also soothes the soul, dig into this disk. For more info ration, go to home.earthlink.net/~fkimbrough/. Frank Kimbrough joins leader and saxophonist Noah Preminger, bassist Ed Howard and drummer Billy Drummond this Saturday November 1 (already!) for an 8:30 p.m. gig at The Side Door Jazz Club in Old Lyme. Young Mr. Preminger (pictured left), a CT native now living in the Boston area and in school at his alma mater The New England Conservatory, working on his Master's Degree, returns to the venue as a leader - he appeared once before as a member of the Rob Garcia 4. Kimbrough appeared on the saxophonist's 2011 Palmetto debut, "Before the Rain" as well as 2008's "Dry Bridge Road", recorded when Preminger was in his senior year at NEC. They work well together, knowing when to push each or when to hold back or when to lay out. Preminger, like the pianist, is a melodic player and, as he has matured, has become an excellent soloist, neither dull nor derivative. The veteran rhythm section will not only be supportive but also knows when to light a fire and build the intensity. Doors open at 7:30 p.m. - reservations and more information can be found thesidedoorjazz.com or by calling 860-434-0886. The music that drummer/composer Tyshawn Sorey creates is truly his own. If you have only seen or heard powering groups led by Vijay Iyer, Anthony Braxton, Steve Lehman, Armen Donelian or the trio he co-leads with Ingrid Laubrock and Kris Davis (Paradoxical Frog), you know that the Newark, New Jersey-native is capable of shaking the foundations. Yet, his own recordings, of which the latest "Alloy" (Pi Recordings), are often quiet with long pieces and, oddly (to some) very little drumming. As a composer, Mr. Sorey shows the influence of Morton Feldman and that influence can be felt throughout "Alloy." With pianist Cory Symthe and bassist Chris Tordini, the 4 tracks are deliberate, filled with moments of silence, quiet interactions and, unlike several of his previous CDs, handsome, long, melodic lines. A sense of sly playfulness can be heard in the trio's interactions on the opening track, "Returns", with Smythe (who is knowns for his work with violinist Hilary Hahn) sounding like Thelonious Monk at times. His solemn solo lines lead into "Movement" - he plays the Satie-like melody by himself for the first 6 minutes (the piece runs 19:52) with his lines opening up as the bass and drums enter. He and Tordini both play melodies as the drummer moves around his cymbals. The pianist's phrases stretch out as the song progresses yet retain a strong melodic bent. "Template" and has a "freer" feel, still quiet, until 2:30 into the 7-minute track when the drummer falls into quite a funky figure. The remainder of the track may remind some of Vijay Iyer's pieces that cross hip-hop beats with trance-like piano figures and bouncing bass accompaniment. The longest track, "A Love Song", clocks in at just under 31 minutes and opens with a long solo piano statement. Filled with repetitive figures, sustained notes, quiet chords that change every now and then, it becomes easy to surrender to the mesmerizing melody. The serenity of the music changes slightly when the bassist enters at the 19:40 mark, his round tones move with the piano and then one hears the quiet cymbal splashes. When Mr. Sorey drops into a slow, soulful, beat, Smythes lines pick up in intensity, like a heavy spring shower falling atop the rhythm section. The bass and drums stop abruptly; the remaining 3 minutes are quiet, impressionistic, piano notes and chords that slowly brig the piece to a close, like the final raindrops coming off the leaves at the end of a summer rainstorm. "Alloy" is stunning, peaceful, challenging, art without artifice. This is music that slowly works its way into your mind and puts you at rest. Even when the Trio goes "out", it's not for long. Upon listening, one might think this is Cory Smythe's album. Those listeners who know the music of Tyshawn Sorey understand that he composes for a "sound", for an overall group impression, and not to show off how great a player he or any member of his ensembles can be. It's a rare gift to hear music this peaceful in such a noisy world. Be grateful for this. For more information, go to www.pirecordings.com/album/pi56 or to www.tyshawnsorey.net. Sketches is a New York-based quintet that has hit upon a unique group dynamic. All of their music is original (not so rare nowadays) with each track composed by one member based on a "sketch" of another member. 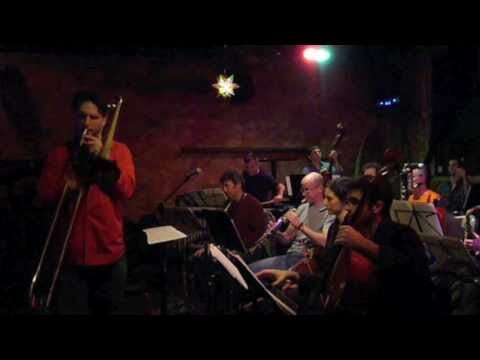 Composed of Jeremy Udden (alto and soprano saxophones), Matt Holman (trumpet and flugelhorn), Jarrett Cherner (piano), Martin Nevin (bass) and Ziv Ravitz (drums, mixing and mastering), the quintet came together in 2011. All are as busy as sideman and/or leaders and their varied influences are evident in the music. "Volume 1" was issued early in November 2013 (though it was recorded 14 months earlier) while the new recording comes from a March 2014 recording session. The way that Udden and Holman blend their sound throughout the recording is quite impressive. Pieces such as "Y & H" and the opening "Caught In The Storm" build from the harmonies the two create as well as the active but never intrusive drumming. Cherner's fine chordal work on "Sirenia" and the ever-so-funky "Bibi" is both melodic and supportive. It may take a few close listens to notice the fine support of bassist Nevin (who has worked with trumpeter Ambrose Akinmusire and Joe Lovano) but his work frees up both the drummer and pianist to explore. As he and Cherner hold down the bottom, Udden, Holman and Ravitz push the exciting "Rub" to its boiling point. As for the drummer, Ravitz shines throughout, whether it's the New Orleans strut of "Hybrid Cars" or The Band-like slow drag of "Hail From Plainville" (which features a delightful soprano sax solo). There is a dramatic quality to songs such as "Wrong Place, Wrong Time", its handsome melody line taking its time to unfold. With the rhythm section pushing the intensity, the alto sax and flugelhorn unwrap the melody with Holman getting the only solo. Whereas "Dyson Ritual" has more fire, especially noticeable in the trumpet and drums interaction in the middle of the performance. Cherner rides the circular bass lines and intense drumming for his solo just before the close of the song. The pianist studied at the New England Conservatory, played with the Marcus Shelby Jazz Orchestra and earned a Master's Degree from the Manhattan School of Music. He's an impressive soloist and an immaculate accompanist. The only track that is not a collaboration is the short (1:13) "Calm After The Storm" that closes the album. All 5 play but there are no solos, just the piano, sax and trumpet sharing the melody line as the bass and drums offer support. "Sketches" becomes songs and songs become vehicles for intelligent and exciting interactions throughout this first-rate program. The quintet does perform live and one imagines the music gets stronger and stronger the more they play together. Honest and unpretentious, Sketches catches your attention from the opening notes. For more information, go to www.sketchesmusic.com.